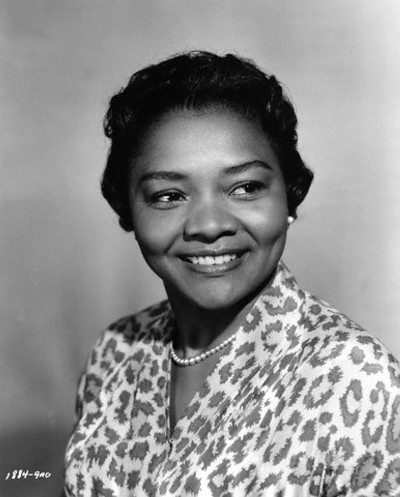 Veteran actress Juanita Moore is fondly remembered for her tear-jerking role of Annie Johnson in Douglas Sirk’s 1959 remake of Imitation of Life. Moore was a groundbreaking actress best known for her role as Lana Turner’s character’s black friend in the film. In 1960 she became only the fifth African American nominated for an Oscar. The nomination was based on her role in Imitation of Life. Born in Los Angeles, California in 1922, Moore graduated with a degree in drama from Los Angeles City College and moved to New York where she began her show business career as a nightclub singer and dancer and eventually worked as a chorus girl in New York’s famed Cotton Club. Moore eventually traveled abroad, performing in top European clubs, including the London Palladium and the Moulin Rouge in Paris, France before embarking on her film career in late 1949, making her debut as an un-credited nurse in the race-conscious film Pinky. In the early 1950s she worked in Los Angeles’s Ebony Showcase, a leading black-run theater. Later in the decade she was a member of the celebrated Cambridge Players which included other up-and-coming black performers such as Esther Rolle. Moore’s performance earned her an Oscar nomination for best supporting actress in 1959. Though Moore has appeared as a supporting actress in more than 70 film and television shows during her six-decade career, Imitation of Life (originally made in 1934 with Louise Beavers and Fredi Washington) remains her most memorable and celebrated contribution to Hollywood film. During the 1960s, Moore also appeared in several stage productions, including Lorraine Hansberry’s A Raisin in the Sun (1959-60) in London, U.K. and James Baldwin’s The Amen Corner (1965). In 1974, she was inducted into the Black Filmmakers Hall of Fame. More recently, she has appeared in two minor film roles, The Kid (2000) and 8 Mile (2002). In 2005, Moore was honored at the Academy Theater at Lighthouse International in New York City at Douglas Sirk’s Imitation of Life Screening and Q & A session. Juanita Moore, the widow of Charles Burris, died on January 1, 2014 in her home in Los Angeles, California. Ephraim Katz, The Film Encyclopedia, (New York: Harper Collins, 1994); James R. Parish, Hollywood Character Actors, (New Rochelle, NY, Arlington House Publishers, 1978); Roy Pickard, The Oscar Stars From A-Z, (London, England: Headline Book Publishing, 1996); Edward Mapp, Directory of Blacks in the Performing Arts, (Metuchen, NJ: Scarecrow Press, 1978).